“We go to the dam every day after classes to fetch water,” she says, and heads towards the nearest source of water in her community. 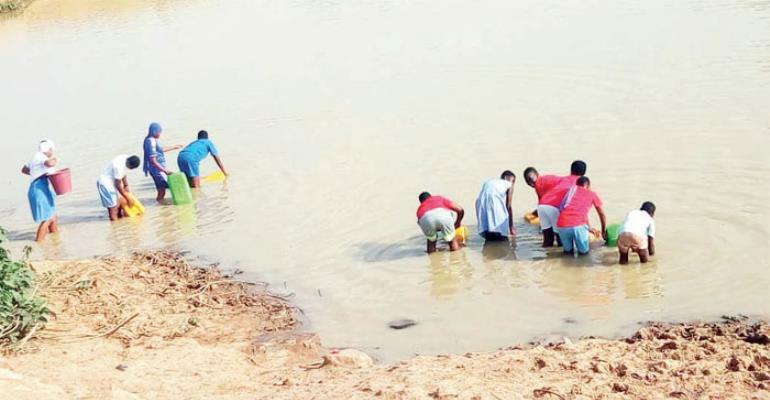 The dam, which is located at Kukuo, a suburb of Tamale, is several kilometres away from Zubaida's secondary school, but this is the alternative source of water for the students since the taps in their school run dry weeks ago. “This is a boarding school and there is time for everything. When we leave like this, it takes some time for us to get to the dam and back to the school. By the time we get back we are tired and cannot study at night,” she laments. But the students are not the only users of the dam; cattle have also found their way to the dam to quench their thirst.The students are, therefore, forced to share the only source of water with the animals. Zubiada's school is not the only educational facility affected by the inadequate potable water supply. Two other senior high schools in the capital of the Northern Region are experiencing the same fate. This has been reinforced by global education for all strategies highlighting how water, sanitation and hygiene (WASH) in schools improves access to education and learning outcomes, particularly for girls, by providing a safe, inclusive and equitable learning environment for all. But data shows that the country's progress towards achieving that goal is very slow, especially in schools. In Ghana, close to six million people (nearly 22 per cent) rely on surface water to meet their daily water needs, leaving them vulnerable to water-related illness and disease, according to WaterAid, Ghana. Further, 67 per cent of Ghanaians lack access to improved sanitation or are entirely without toilet facilities. “Mostly districts and municipalities are not supposed to be within the Ghana Water Company but due to the bad ground water situation in the north, they are forced to join because even if they dig boreholes they cannot get access to water,” he explains.